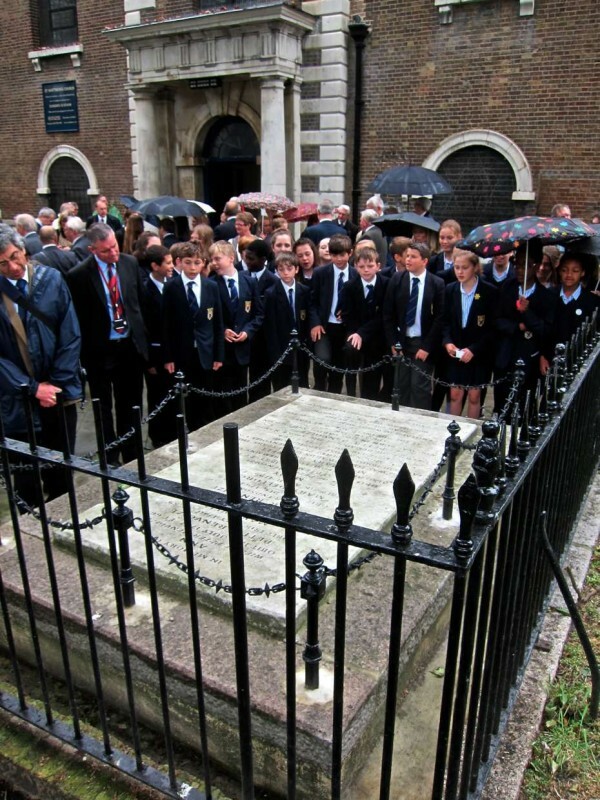 Pupils of Parmiter’ School, which moved to Watford from Bethnal Green over thirty years ago, returned to the East End yesterday to honour Peter Renvoize, one of their benefactors who is buried in the churchyard of St Matthew’s. 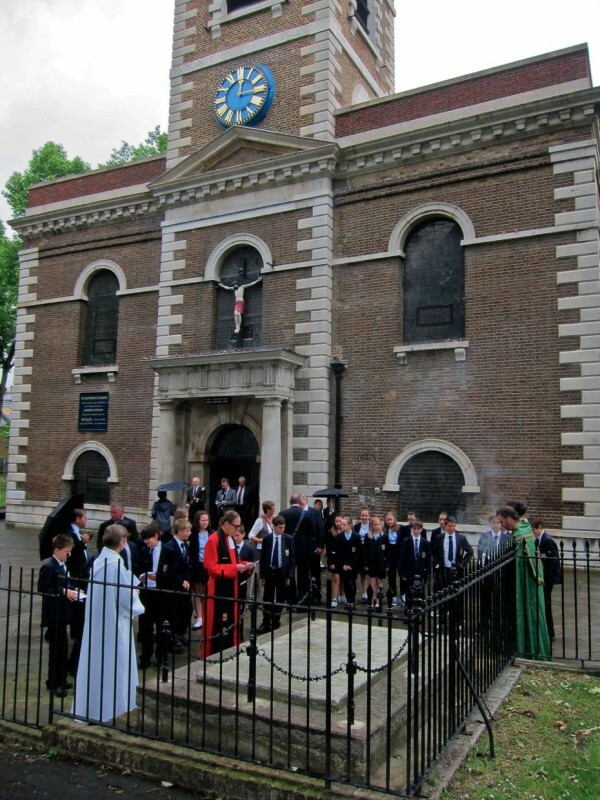 They were joined by members of the Old Parmiter’s Society of Bethnal Green for a service of rededication of the Renvoize family tomb which has recently been renovated. And I joined the excited throng as guest of Parmiter’s old boy Ron Pummell. In his will of 1682, silk merchant Thomas Parmiter left two farms in Suffolk to supply income for “six almshouses in some convenient place upon the waste of Bethnal Green, and further, for the building there one free schoolhouse or room, wherein ten poor children of the hamlet of Bethnal Green may be taught to read, write…” Yet it was not until 1720 that his legacy had accrued sufficient funds, and the buildings in Grimsby St, off Brick Lane, were only completed in 1722. 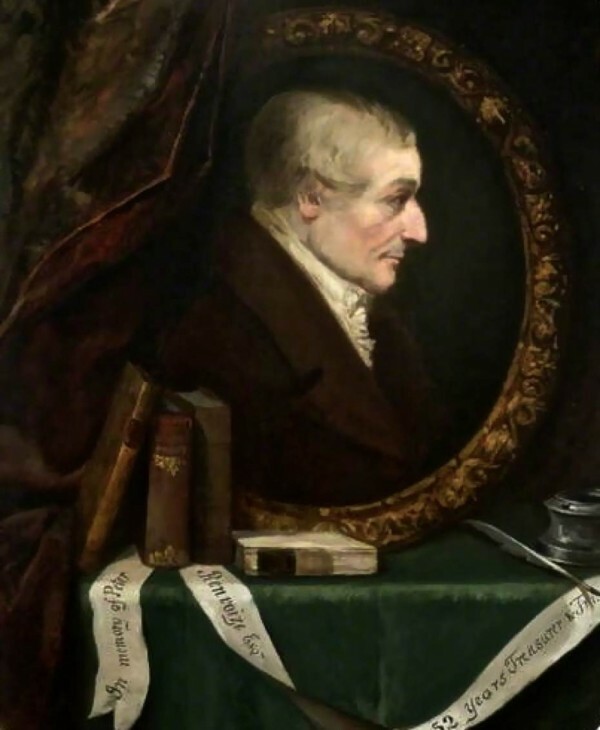 In the nineteenth century, the school’s most generous benefactor was Peter Renvoize (1757-1842) who left £500 to Parmiter’s, plus £10 to the master and five shillings to each schoolboy, along with the wish that his family vault be kept “In good repair and condition.” By chance, Peter Renvoize’s tomb and that of his contemporary Joseph Merceron (1764–1839), were the only two graves out of eighty thousand buried here that survived the bombing of the church in 1940. And thus you might think yesterday’s service of rededication of the tomb was a simple celebration of the enlightened altruism of the venerable Peter Renvoize, yet the truth is more equivocal. 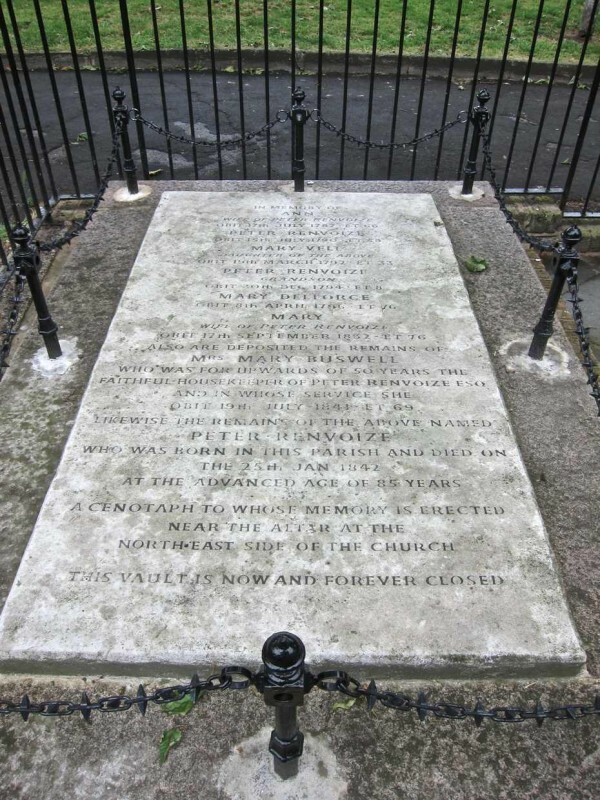 Peter Renvoize and his henchman Joseph Merceron were two of the most notorious characters in the history of Bethnal Green,whose activities included swindling the poor funds at St Matthew’s of £925 in 1819. The ambivalence of the occasion did not go unacknowledged by Rev Kevin Scully, Vicar of St Matthew’s. In his welcoming address, he laid it out fair and square, outlining the notoriety of Joseph Merceron who was both church warden and owner of a number of disorderly pubs and brothels in Bethnal Green – before serving time in prison only to return to the role of church warden again. 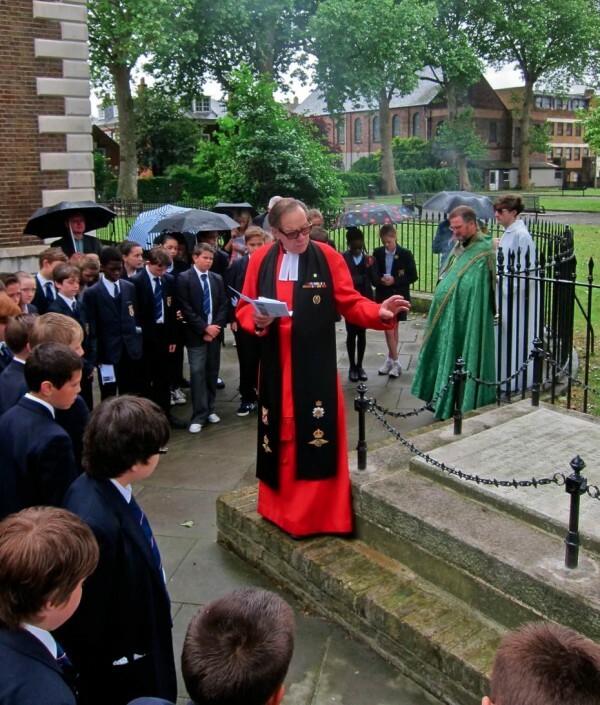 Once headmaster, Nick Daymond, had read from the book of Corinthians reminding us all that charity “Rejoiceth not in inquity, but rejoiceth in the truth,” and after we had all sung the school song we filed out into the church yard in the rain to peer at the tomb where Peter Renvoize lay buried beneath. 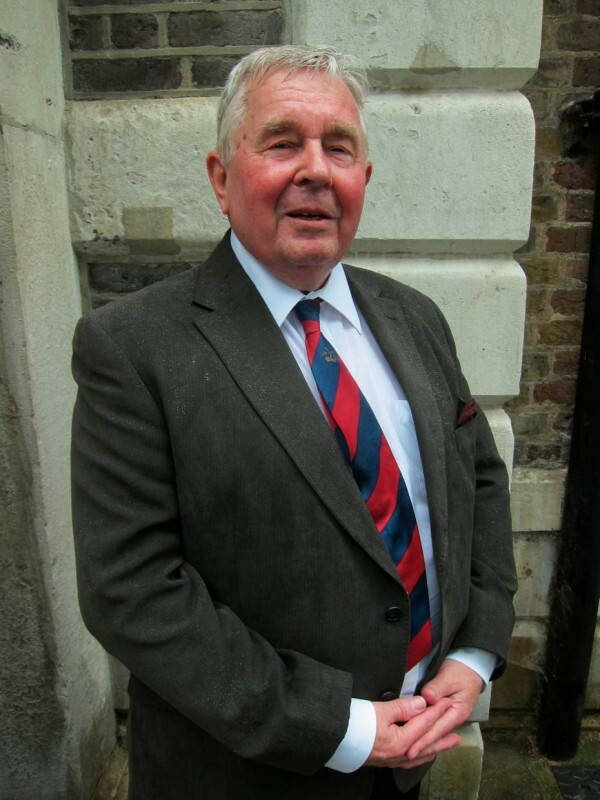 Afterwards, it was my pleasure to be introduced by Ron Pummell to some of his fellow members of Old Parmiter’s Society who had attended the school before it moved from Bethnal Green. Running through a distinguished list of former pupils, Ron mentioned Nick Leeson, the trader that bankrupted Barings Bank, who attended Parmiter’s after the school moved to Watford. “We always say, ”If he’d been a Bethnal Green boy, he would have got away with it,’” he joked. Rev Gp Capt Donald Wallace rededicates the tomb of Peter Renvoize. Peter Renvoize, school treasurer, who conspired to swindle £925 from the poor of Bethnal Green in 1819. 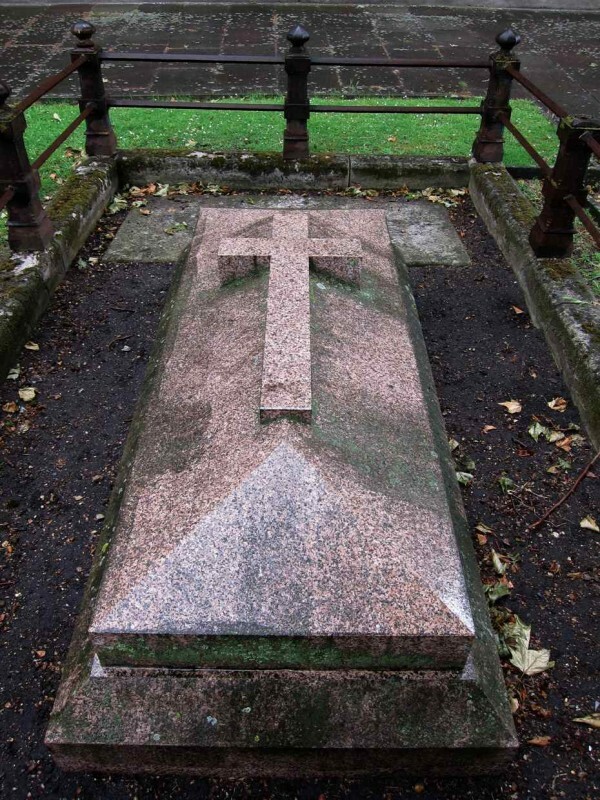 The tomb of the Merceron family – Joseph Merceron was church warden, magistrate and a notorious criminal of Bethnal Green. Normally I am all for spending money on revitalizing church yards and in particular tombstones and grave markers (they can tell many an interesting story…) but I don’t know in this case whether this was a good signal to send to the school children surrounding the newly restored grave of Renvoize, that those who steal will be forever looked after, even in death ! Yet another great article! I wish I had known about this event! The full story of Joseph Merceron and his sidekick Peter Renvoize is set out in my forthcoming book ‘The Boss of Bethnal Green: Joseph Merceron, the Godfather of Regency London”. Further details will be posted at http://historylondon.wordpress.com. I find this blog and endless source of fascination that, quite honestly, creates little highlights of interest with every email link I receive. I’m “signed up”to many sites(most are advertising) but this one is different. I read and savour each page avidly like a bestseller. I’m so proud to be an Eastender and love visiting the historic sights. We used to live in the Peabody Buildings off Whitecross St band the whole of my family were from the locality.I’m a descendant of the Crudgingtons , a notorious19th century criminal family. Difficult to work out how I’m related as there was bigamy and illegitimacy in my line but one Daniel Crudgington (born 1815 Spitalfields), opened our family grave. Thank you so much for making my knowledge and connection with the area the richer. Is this why my family’s not rich? They were amongst the poor of this parish at that time! 30 years ago was when my Grandfather Lewis Lewis (Lewis’s Milk Supplies being his business) & my Father Lewis John Daniel Lewis (with his business W.H. Clark (London) Limited – now renamed Daniel Lewis & Son) bought all of the derelict Hackney Road & Cambridge Heath Road properties/shops and flats from Parmiter’s School Trust and they used the money to build a new annex on the school (since recently demolished and replaced & move to Watford, that would of been back in the 1980′s and now we are moving to pastures new ourselves, after having spent 216 years in Hackney Road. @David Lewis: I worked in the grocery shop your father had in Hackney Road for about 6 months – Lewis milk supply. That was around 1974. I think your mother was called Iris? I got paid 75p an hour – which wasn’t bad in those days. I think I remember you as a very small boy – you would have been about 6 years old at that time?